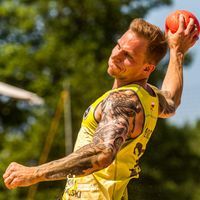 After having successfully hosted the ebt Finals 2018, the next major beach handball event is set to take place in Poland. The EHF Executive Committee at its meeting in Glasgow on Monday followed the Beach Handball Commission’s recommendation and awarded the Beach EURO 2019 to Stare Jablonki in Poland. The EHF’s beach handball flagship event will be preceded by the Men’s and Women’s 17 Beach EURO in the same location. Playing dates are 27 to 30 June 2019 for the under 17 championship and 2 to 7 July for the senior event. Furthermore, location and dates for this year’s EHF Beach Handball Champions Cup have been confirmed. The event takes place from 25 to 28 October 2018 in Catania on the island of Sicily.